Apex Legends’ Gibraltar has always had a bit of a tough time. The sheer size of his hitbox – which makes him more than twice as easy to hit as the game’s smallest characters – and lack of mobility lead many players to opt to play as somewhat more slippery customers. Thankfully, some opportunistic players have come up with a means to address at least one of those concerns. Gibraltar’s passive ability allows him to call up a small personal shield whenever he’s aiming down his sights (blocking at least some of his broad stature). In a post on Reddit, one player explored what might happen when that ability interacted with Octane’s ultimate, Jump Pad. 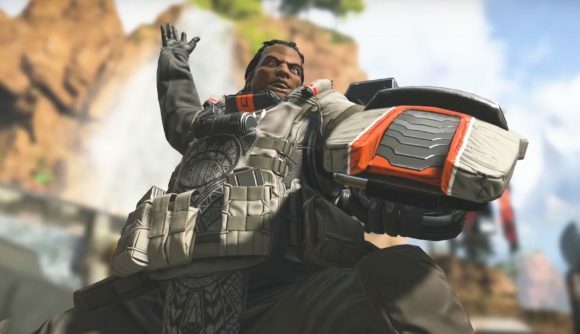 When Apex Legends’ newest addition uses that ability, he drops, well, a Jump Pad to the floor, allowing players to spring off it to get into (or out of) a battle quickly. I’d initially imagined the aim was to recreate this clip from The Avengers where Black Widow jumps off Captain America’s shield, but the reality is far more entertaining. While the Octane’s dreams of leaping around the map on the front of a shield didn’t really work, Gibraltar got a lot more use out of his new piece of kit. By aiming directly down and jumping, the player was able to fling themselves into the air far higher than they would have managed from a normal jump. In some games, that might prove painful, but Apex Legends doesn’t feature any fall damage, meaning that even if Gibraltar doesn’t stick the landing, he’s not in any danger. A secondary video, this one from the Gibraltar’s perspective, makes it clear just how fast the character can move using this strategy. It’s not exactly precise, but you can hear a teammate in the background complaining about how difficult it is to keep up. Obviously there are a few limitations around this particular move – Gibraltar has to aim down sights forever, and Octane will need to get their ultimate up before you can pull it off – but it’ll be interesting to see if Respawn chooses to respond to the strategy. On the one hand, it’s clearly a bit of mobility that they never accounted for, but on the other, it looks like an awful lot of fun.